In this book, the internals of PostgreSQL for database administrators and system developers are described. 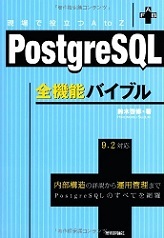 The main purposes of this book are to explain how each subsystem works, and to provide the whole picture of PostgreSQL. If you are a PostgreSQL data architect or an administrator and want to understand how to implement advanced functionalities and master complex administrative tasks with PostgreSQL, then this book is perfect for you. Hironobu Suzuki graduated from graduate school of information engineering (M.S. in Information Engineering), have worked for several companies as a software developer and technical manager/director. He published seven books in the fields of database and system integration (3 PostgreSQL books and 3 MySQL books). He was a director of the Japan PostgreSQL Users Group (2010-2016).